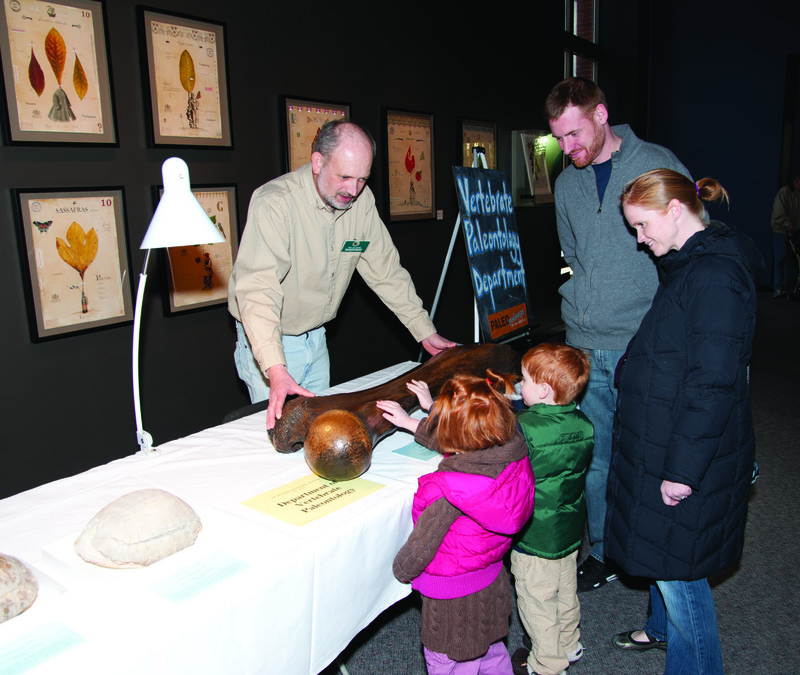 Visitors to Paleopalooza enjoy touching a real fossil with the help of Academy Vertebrate Paleontology Collection Manager Ned Gilmore. PHILADELPHIA (January 23, 2015) — Paleopalooza, a weekend festival featuring dinosaur fossils, paleo-illustration classes, engaging live animal shows and more, will take place Saturday and Sunday, Feb. 14 and 15, at the Academy of Natural Sciences of Drexel University. Academy scientists will be on hand to show off rarely displayed Devonian fossils they collected in central Pennsylvania. Families can dig for real fossils to take home and get tips from a paleo-artist on how to draw a dinosaur. Buddy the T-rex, from the popular TV show Dinosaur Train!, and the Academy’s own Eddie the T. rex will be roaming the museum throughout the weekend. Paleopalooza is free with museum admission and runs from 10 a.m. to 5 p.m. both Saturday and Sunday. The festival coincides with the opening weekend of the new exhibit Titanoboa: Monster Snake, about the largest snake that ever lived. Titanoboa will be on display through April 19. Here are some more highlights of the fun activities to look for at Paleopalooza on both Saturday and Sunday. For more, visit ansp.org. See a real duckbill dinosaur fresh from the field as it is prepared in the Fossil Prep Lab. Dance to hip tunes by the Diggity Dudes band. Noon and 2 p.m.
Take a guided tour of Dinosaur Hall.10 a.m., noon, 2 p.m., and 4 p.m.
Watch paleo-illustrator Jason Poole bring dinosaurs to life and try drawing your own dinosaur. Make a dinosaur food chain and other paleo-perfect crafts to take home. Enjoy four different live shows: “So you want to be a paleontologist?” at 11 a.m.; “Snakes Alive!” at 1 p.m.; “Old Bones, New Technologies,” with Drexel University Professor Kenneth Lacovara, who discovered Dreadnoughtus, at 2:30 p.m.; and “Birds of a Feather” at 3:30 p.m.